Many thanks to Luke Steelman who, working with Ami Steelman, created a wonderful marketing flyer for EdCampOKC! The conference is coming up fast on Saturday, February 23, 2013. The flyer is available in PDF format. Please forward, print, and distribute this flyer by all means possible to educators you know who might be interested in attending and participating in our first Oklahoma EdCamp! 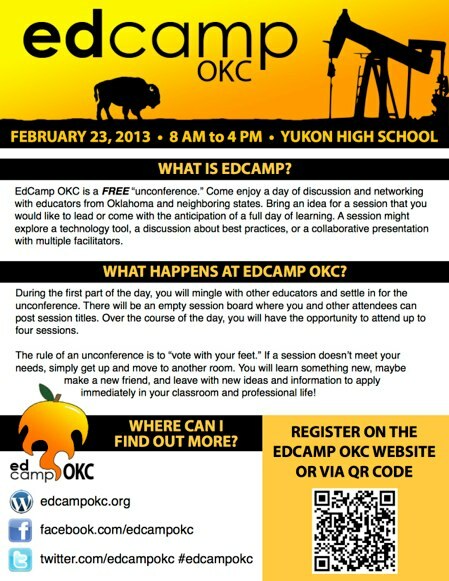 Also please refer people to our official EdCampOKC press release for more information. This entry was posted in news and tagged edcamp, edcampokc, flyer, oklahoma, oklahomacity by Wesley Fryer. Bookmark the permalink.